Pat steak dry on both sides with paper towels. Liberally coat both sides of steak with salt and pepper. Heat a cast iron skillet or heavy pan. Add olive oil, and when hot, place steak in the pan. Sear for a few minutes on each side and edges until browned. Add garlic, herbs and 2 tablespoons of butter. When melted, spoon over steak and rub garlic over steak. 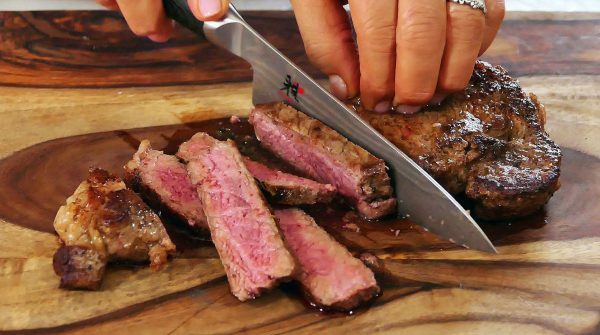 Cook steak to 125 degrees for rare. (Cook about 3-4 minutes after searing.) At the end of cooking process, add last tablespoon of butter, let melt and spoon over steak. Remove steak and let rest uncovered for about 4 minutes. Slice and enjoy!